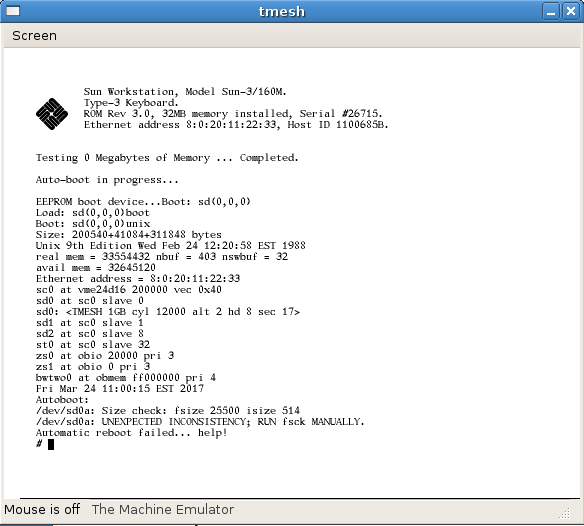 This just in, I have just booted Research UNIX v9 on TME’s SUN-3 emulator! 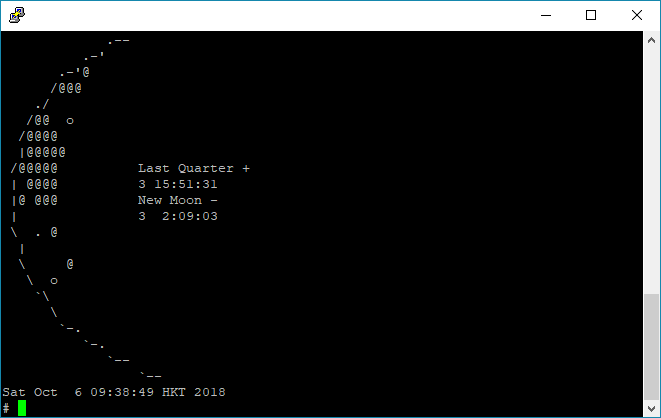 And there we are booted up and logged in.. pardon the disk error..
I’m slightly hesitant about uploading it, as it clearly isn’t right… And this is only the binary component, I have integrated the source tree onto the disk image. But I haven’t actually tried to compile anything except a simple hello-world program. You can download it here from sourceforge: SUN3-research_v9.7z If anyone want’s to browse the source, it’s on my CVS browser thing. DooM is without a doubt one of the most popular PC games of all time. And thanks to it being written in C is also an incredibly portable game. One platform that mysteriously was lacking DooM was the SHARP x68000. 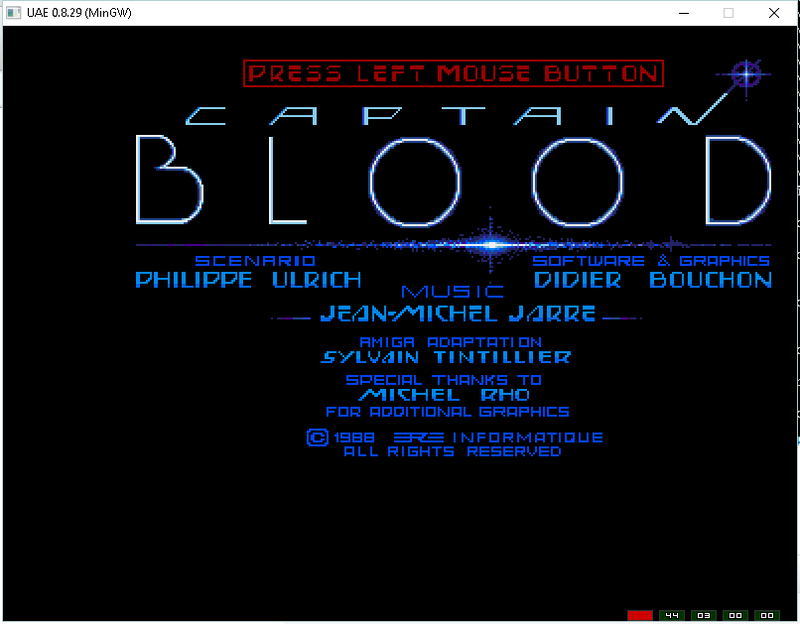 After a bored day of playing with the source to Mariko’s GCC 1.42 / 1.30 that targets the x68000, I thought I would take a stab at trying to compile DooM. Since I’m using such an ancient version of GCC the first stumbling block is that DooM is FULL of C++ style comments, which older K&R & ansi based compilers of the late 1980’s simply cannot handle. So the first phase was to convert all the comments. And away we go. Having learned the ‘null’ lesson of Quake 2 the hard way, I started out with a working copy from Windows, via GCC 1.40 for Windows/RSXNT. I figured that by having a ‘known good’ build with the a very close compiler level would be a good start as I don’t want to fight too much with the compiler. After it was running with minimal changes, it was time to start the real fun. 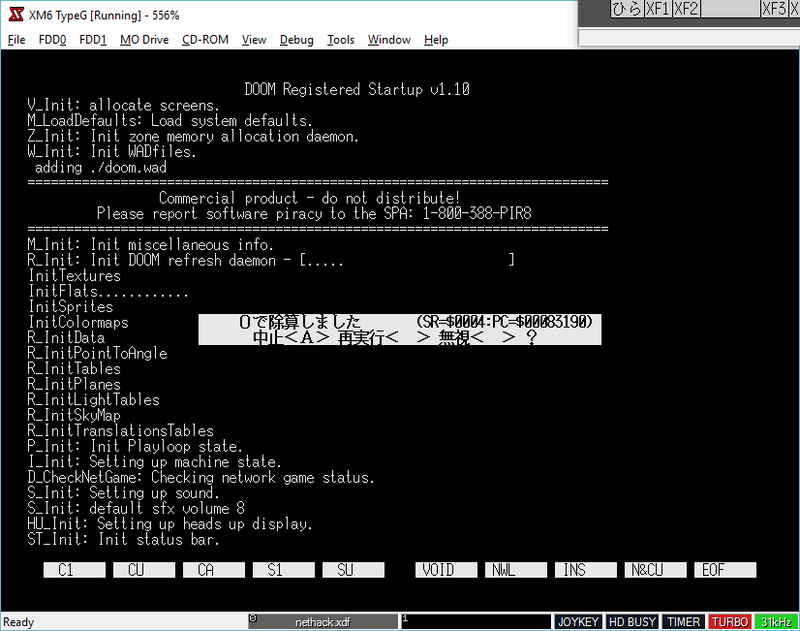 And from there after trying different assemblers, flags, and all kinds of other things we could finally get null DooM running on the x68000 via 68030 emulation on XM6 TypeG. There is no correct palette setup at this point, there is all kinds of issues but you can see the startup logo being painted! Then with a lot of improvements, and an added keyboard driver it was starting to look like DooM! 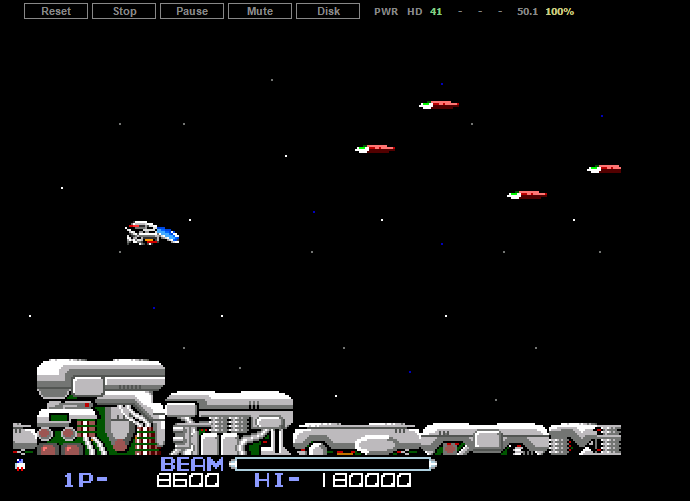 And then Neko68k had a major breakthrough with the video, timer and keyboard, and we now have a playable port! Around this time I had noticed that when I built a cross compiled version the video for me was garbled. After some investigating it turns out that m_swap was not being compiled correctly but rather the endian order was being reversed!  I tried re-building, re-configuring my host setup, and I still had the same issue. I tried downloading GCC 1.42 and building an i386 SYSV to AT&T 3b1 cross compiler as it too is 68000 based, and I got the same issue. Maybe it’s a bug in GCC 1.x cross compilers? I don’t know, but since the procedure is small enough, it was easier to just have the native GCC produce an assembly version which I just assemble and link without issue. Behold! DooM on the x68030! Yes, there is no audio, but wow it’s playable! I do need to map the keyboard better in the emulator, but the key layout in the source is fine. But sure enough, the file GNUMPW.SIT, and the later gcc-1.37.1r15-all.sea.bin are the real thing! The file GNUMPW unstuffs to GCC 1.37.1r7(All), although Stuffit 5 and higher won’t unpack the file, I’ve converted it unpacking with version 4 & repacking with 5.5. The readme from r7 is dated November 2nd, 1990. I found some history on this port on the archives of the GCC mailing list here. 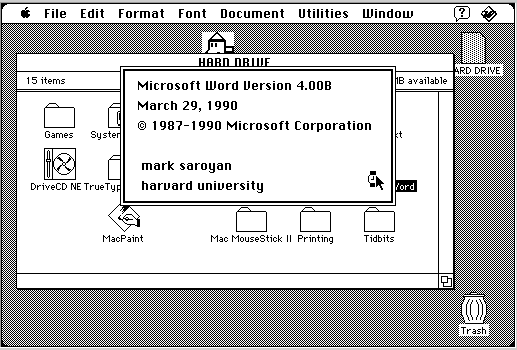 The port was done by Stan Shebs, while working for Apple. 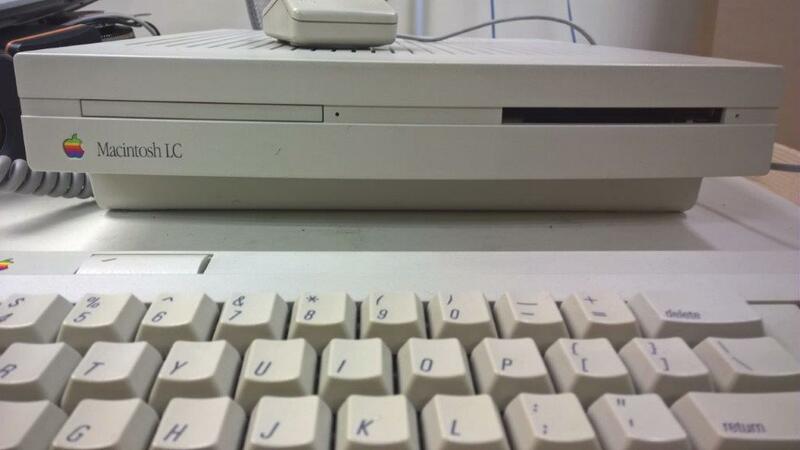 As he states the port started in 1989 and was first used in an abandoned m68k based project, and later a possible replacement for the Apple compiler for OS 7. For this experiment I was using the r15 version, as I didn’t find anything out about the prior versions until after I had written this. GCC on MacOS needs the MPW environment, which for me is incredibly awkward to work with. While some people may love it, it is very strange in that you have to highlight commands in the window, then hit clover+enter to run them. 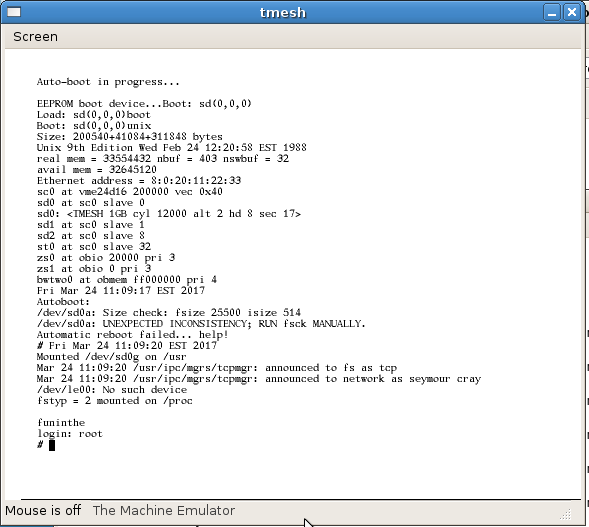 Like a mainframe, you can input commands wherever in the screen. The next hardest thing was finding a version of MPW that will work with this. It needs the MPW C compiler for it’s includes, and libraries. The 3.5 stuff didn’t seem to work for me, however doing a LOT of searching, and I did find a ‘toast CD-ROM’ image‘ of 3.1 that includes all the C, and Assembler tools that I need to build an executable. I also don’t know why, but running make just shows me what needs to be done, it never actually makes anything. I’m probably doing something wrong, but for such a long dead tool, trying to find out how to use it, or how do you interrupt a “stream” like manually running cc1 is beyond me. 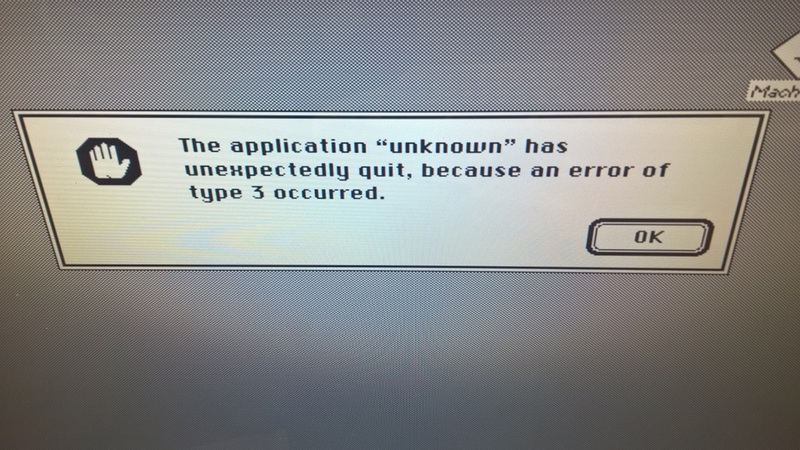 I just have to force quit the emulator. But beyond that, running make gives me the steps, and I manually select and run the steps, and I was able to get a program to run! I know it may not look like much, but getting it to actually run something was quite monumental for me! I thought for the hell of it, I’d try to build the InfoTaskForce 1987 interpreter, but it seems to get confused at the whole input method. There were some issues compiling input.c, as it didn’t like the external table, so I made it’s own local table. It also didn’t like some pointer arithmetic, but making GCC happy only gives me a program that can’t recognize any verbs. And from there it won’t quit, basically hanging the system. I’m sure I’m doing something wrong, but at the same time it was interesting to see GCC on MacOS, during the whole GNU boycott of Apple for the ‘look and feel’ lawsuit against Microsoft. No doubt it let a lot of people sell other C compilers on the Mac Platform during this window of time. 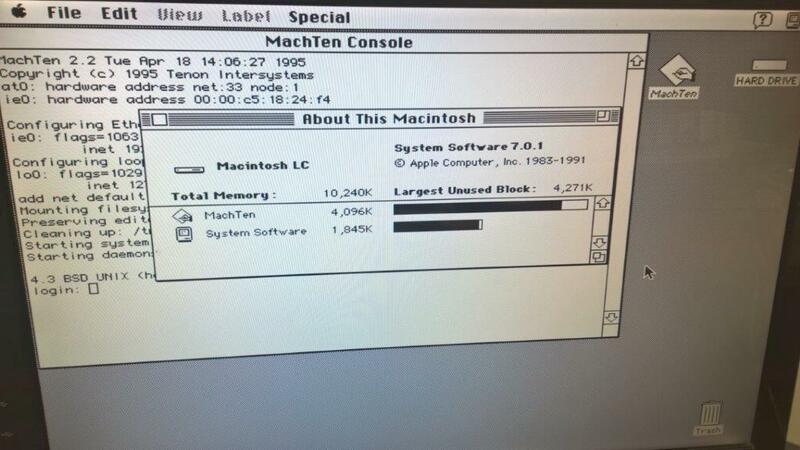 GCC requires a 68020 processor, as GCC’s native 68000 based target would be SUN-2 hardware. While it can compile with the -m68000 flag, I haven’t tested with a 68000 based emulator to see if that’s even true. In the off chance someone wants a combined MPW+GCC I made a disk image here: MPW 3.1 with GCC 1.37.img.gz. Disk Copy 6.3 should be able to mount it OK, or any emulator that likes HFS disk images. What is cool is that 0.7.6 (perhaps earlier versions of 0.7?) switched from a non commercial license to the GPL 2.0 license. I managed to ‘fix’ the keyboard in this version so that not only does it not type too fast, but it’ll remember “sticky” keys like shift, control & meta. So now you can actually use the CLI, and change disks. Double clicking is an impossibility as it simply runs far too fast. 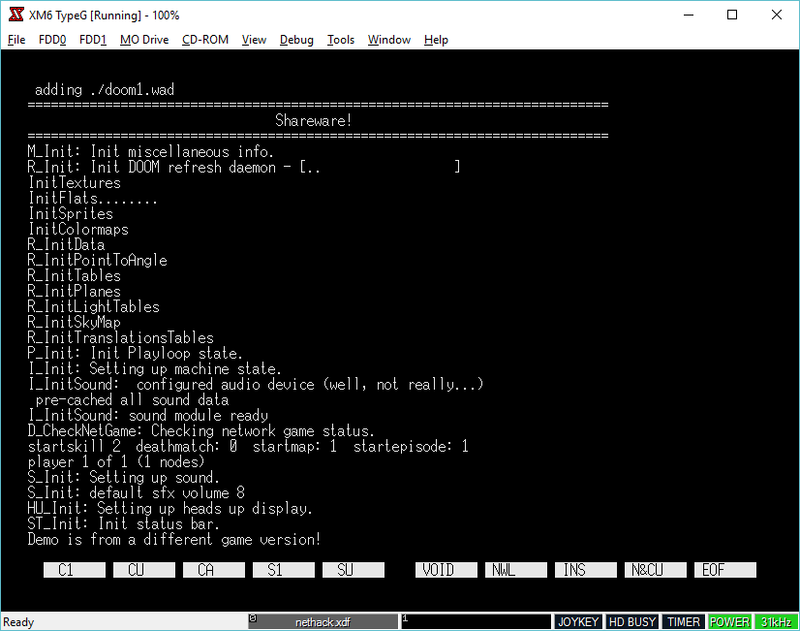 I compiled in audio support but didn’t bother with the SDL end, as it would sound like noise with it running so fast. I also updated UAE 0.4, with the fixed keyboard code, and it’s usable now as well, with the same caveat that it simply is just too fast. UAE is from an era where a 100Mhz computer was a luxury item. Now some $5 computer, you could pack in breakfast cereal has a 1Ghz processor. For the 2/3 people who care, I put the binary & source tree on sourceforge here. UAE 0.4 & UAE 0.1 are also available for download, plus all the source code I’ve been able to find. Author neozeedPosted on May 7, 2016 Categories 68000, 68020, Amiga, microsoft windows, mingw, UAELeave a comment on Ported UAE 0.7.6 to MinGW!